The latest slot from Blueprint Gaming is based on a popular adventure movie from the 1980's. The Goonies slot is based on the American adventure comedy movie from 1985 which was directed by Richard Donner. The movie features a group of misfit kids that live in the famous Goon Docks area situated in Astoria, Oregon. The reels are beautifully portrayed across the old treasure map the movie is based on, while music and soundbites from the film dominate the soundtrack of the slot as a bunch of intrepid kids search for One-Eyed Willie's Treasure. 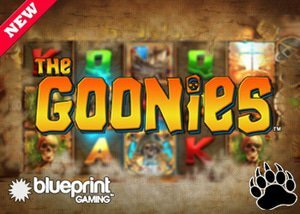 The new The Goonies Movie slot from Blueprint Gaming casino software presents players with 20 paylines on a 5x3 reel structure along with loads of randomly triggered events and a bunch of extraordinary bonus features to keep players intrigued. The wide range of bonus features include wild symbols, scatter symbols, six One-Eyed Willie Bonus features, and six One-Eyed Willie randomly triggered reel features along with a top paying jackpot bonus worth 500 coins. The 17th-century Spanish doubloon takes the role of the game's wild symbol and will stand on for all regular symbols to potentially generate a win, except for the game's scatter symbol. Displaying 5 Spanish doubloon wild symbols anywhere in view will award you with 500 coins. One-Eyed Willie will represent the scatter symbol in the game and is also the key to unlocking one of the One-Eyed Willie bonus features. The slot also boasts with six different mini features which can be randomly triggered during the base game. The Truffle Shuffle Wilds feature will add extra wild symbols to the reels, while Mikey's Hidden Riches feature can transform certain reels to become completely wild. Data's Colossal Symbols feature will turn three adjacent reels to transform into one gigantic symbol, while Mouth's Lucky Coins feature comes with gold coins which will stick to the reels and turn into a matching symbol once the reels come to a stop. One-Eyed Willie's Bonus Boost feature will add additional scatters to the reels, while Sloth's Win Spin feature will guarantee a huge win when it's triggered. Fratelli Hideout Bonus: Players will need to select a key to disclose one of three possible outcomes: CASH ADD will add an instant cash prize to your bankroll, COLLECT will end the feature, and HIDDEN TUNNEL will trigger one of the remaining 5 bonuses features. Skeleton Organ Bonus: Players will need to pick organ keys to display icons. Every character will correspond to a bet multiplier. When a player reveals an UPGRADE icon, the bet multiplier will be increased. Revealing 3 key symbols will unlock an additional bonus feature. Avoid the Crossbones and Skulls as they decrease your 3 lives in the bonus feature. Super Sloth Free Spins: Players will be taken to a new set of reels where the Fratelli family will be featured. Should a Super Sloth wild symbol be displayed while there are Fratelli symbols on the reels during the free spin feature, the Fratelli symbols will transform into the top symbol. Once the free spins are depleted, players will receive one more opportunity to win additional prizes by selecting one of three chests. The chests can either award 5 extra free spins, and additional One-Eyed Willie bonus feature, or end the bonus game. Goonies Go Wild Free Spins: Players will be awarded 5 free spins and after every spin one of the 4 high-valued symbols will transform into a wild symbol. Once the free spins are depleted, players will receive another opportunity to win additional prizes by selecting one of the three Copperpot Doubloons. The Copperpot Doubloons can either end the bonus game, award 5 additional free spins or trigger an additional One-Eyed Willie bonus feature. Inferno Free Spins: During this free spin feature, the inferno will make its way across the reels starting from right to left. The inferno can transform between one and three successive reels into wild reels. Once the free spins are depleted, players will give another opportunity to win more prizes by spinning a wheel. The wheel can either award an additional One-Eyed Willie bonus feature, 5 additional free spins, or end the bonus game. One-Eyed Willie's Treasure Chest: This is the most rewarding bonus feature in the game. Players will need to collect 5 bonus symbols during one of the above-mentioned bonus features to unlock the One-Eyed Willie Treasure Chest bonus feature or by gambling their way up following the first pirate ship wheel spin. Players will collect multipliers in the bonus game until a booby trap is revealed which will end the bonus feature. With a payout rate of 96.00%, the new Goonies slot can be enjoyed at a wide range of Blueprint Gaming casinos from 25 October 2018. Grizzly Gambling recommends that you play The Goonies slot at Betsson Casino where players are welcomed with a generous 100% bonus along with plenty of popular payment methods, incredible customer support, and a wide variety of casino games from other renowned software providers.